Recreational Vehicle (RV) Accident Attorneys | Davis Law Group, P.S. The award-winning attorneys at the Davis Law Group represent those injured by Recreational Vehicle (RV) and motor home accidents in Washington state. State laws do not require special driving permits for recreational vehicles (RVs) despite the fact that they are more difficult to maneuver and handle. Inexperienced drivers who operate over-sized vehicles such as motor homes and campers are a potential danger to other automobiles on our roads. In many cases, drivers of RVs are senior citizens and many have difficulties seeing, steering, and reacting quickly to certain driving conditions. And because of its sheer size and poor maneuverability issues RVs and motor homes are prone to accidents. If you or a loved one has been involved in an accident involving an RV or motor home, contact Davis Law Group today at (206) 727-4000. Determining liability in an RV or motorhome accident can be complicated. Depending on the specific circumstances of your accident, liability may fall to several different parties: a driver, manufacturer, and/or the retailer. At Seattle-based Davis Law Group, our attorneys have decades of experience handling RV accident cases. Our attorneys will fight to obtain the maximum compensation available for accident victims. For a free case evaluation, call us today at (206) 727-4000, use the chat feature below or fill out the form on this page. Class M: Authorizes an individual to drive a motorcycle or moped. Driving an RV can be very difficult, and those that are inexperienced will find that they do not handle in the same way as a passenger car. RVs are obviously much larger, and require extra clearance space and longer stopping distance when braking. Those that do not take those things into account — or drive an RV in a reckless manner — are putting themselves and their passengers at risk. But not all RV accidents are caused by the driver’s error. Your RV accident attorney will work to determine the exact cause of your accident and gather evidence to support your claim. An RV accident can cause catastrophic injuries with life-changing consequences like those in large commercial vehicle collisions. Your exact injury depends on the type of crash that occurred, as well as many other factors. Your injury should be diagnosed by a medical professional immediately after the incident. If you or a loved one has been injured in an accident caused by an RV or motorhome driver, there’s likely extensive damage to your property, along with serious injuries to yourself and passengers. And the reality is the greater the damage, the more aggressive the negligent RV driver’s insurance company is likely to be in disputing your claim. Seriously injured in an RV accident in Washington state? Want to know if you have a legal case? Want to know what your case is worth? Want compensation for your injuries? Want justice for your loved ones? Want to make sure the same thing doesn’t happen to someone else? 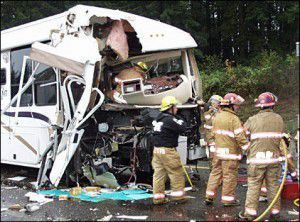 The motor home accident attorneys at the Davis Law Group have the skill and expertise necessary to help you. Call (206) 727-4000 now for a FREE legal consultation regarding your RV accident injury case. We serve accident victims all over Washington State. We can also arrange to have one of our investigators come to you if you are unable to visit our office.